A murder close to home. A case that seems open and shut. Will Poe’s rush to judgment make his fiancé the next victim? Edgar Allan “Poe” Rutherford didn’t think twice when he took his fiancé’s case. After all, Detective Alana Hu had known the victim since childhood. Besides, the evidence is easy to decode: all signs point to the victim’s estranged husband. As Poe works to get the killer behind bars, he can’t help but be distracted by his fast-approaching wedding. But Maui beaches have a knack for luring people into a false sense of security, and Poe’s error could extract the highest cost imaginable. After all, you can’t have a wedding… without the bride. 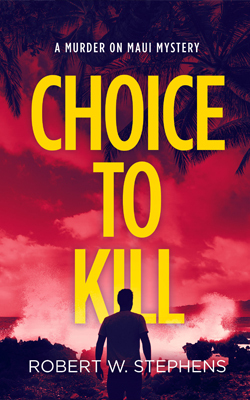 Choice to Kill is the fifth book in the Murder on Maui mystery thriller series. If you like captivating characters, tropical locales, and twists you won’t see coming, then you’ll love Robert W. Stephens’ gritty island tale. Buy the book to solve the Maui mystery today!